Note to the reader: This is an essay I wrote in reply to the July 2009 Ensign's call for articles. The theme was around Elder Robert D. Hales' conference talk entitled "Christian Courage: The Price of Discipleship". Constructive criticisms, critiques and other comments are appreciated before I submit this essay to the Ensign. In my experience as a volunteer with FAIR, I have had several opportunities both in person and on various online message boards and chat rooms to engage with critics of the Church and its teachings. These experiences have been interesting, exciting, uplifting, faith-promoting, frustrating, irritating, and disheartening simultaneously. While I have learned much from engaging with critics of the Church and my testimony in the Restored gospel has grown stronger with my experience with FAIR, I have at times come away from these interactions in a bad temper or exceedingly vexed. Usually it is after I have been vigorously Bible-bashing or contending with a heated ego and temper against someone who is as equally sure of their convictions as I am of mine. Thus, these words from Elder Hales have been very important to me as I have interacted with critics and skeptics. They remind me of how I must react to critics and skeptics the same way the Savior would - with love and understanding that even those critics who I debate with are children of our Heavenly Father who have their right to their free will and agency. However, one particular moment has always stood out above others to me as an example of how I was able to exhibit Christian courage in the face of adversity and skepticism. Every six months at General Conference, I travel down to Temple Square with a couple of my fellow volunteers from FAIR to speak with and engage the anti-Mormon street preachers who try pester and provoke the Saints with unsavory epithets, distasteful slurs and repugnant accusations against the leadership and doctrines of the Church. During the April 2009 General Conference, I met a man at Temple Square, an Evangelical Christian with a large poster who was there to, according to his own account, “witness” to the Saints, with whom I began to speak with. This man informed me that he was a former member of the Church who discontinued believing in the Restored Gospel. When I asked him why, he stated that he came to believe that the doctrines of the Church were not compatible with the Bible. After listing some examples, such as the unique understanding of the Godhead that the Saints hold to compared to conventional Christianity, this man then began to ask me various questions designed to challenge my faith in the Restored Gospel: How can you believe in the Book of Mormon when there is no evidence for its authenticity? Are you aware that the LDS view of the nature of God is not at harmony with the Bible? How can you believe in Joseph Smith as a prophet even after he uttered false prophecies? The Bible makes itself clear that it is the sole source of authority. How, then, can you accept additional scriptures? I could tell that my non-confrontational approach to these accusations had made an impact on this gentleman, as he seemed to open up and began asking questions that were not so much aggressive but genuinely sincere and thoughtful. He asked me what I thought about Jesus Christ. I responded that my faith is in Jesus Christ as the Son of God and the Savior of the world. He asked how I knew this. 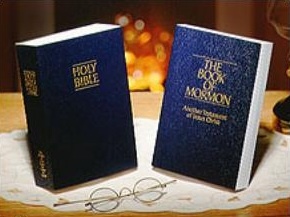 I responded that my testimony came from reading the Book of Mormon and the teachings of the prophets therein. I could tell that because our encounter did not turn into a vindictive and egotistical debate but instead became a sincere and friendly discussion, I was more easily able to share my testimony of the Restored Gospel of Jesus Christ with this man. Because of the fact that the spirit of contention was unable to penetrate the atmosphere, the Spirit of our Heavenly Father was able ﬁll both our hearts and plant within them peace. We ended our conversation with good feelings towards each other and the spirit radiating within us. This demonstration has shown me that Elder Halesʼ principles taught in his General Conference speech are true, and that by abiding by these precepts when we encounter criticism and skepticism we can hopefully escape the spirit of the contention and do our best to stand ﬁrm in our faith and our testimonies as we bear witness of the truth. We will all ultimately face criticism. We will all be asked questions about our faith from both sincere and insincere people. It is therefore imperative that we as Latter-day Saints remember to exhibit Christian courage in the face of adversity and afﬂiction and to “stand as witnesses of God at all times and in all things, and in all places” (Mosiah 18:9). Early Christians in Disarray: Contemporary LDS Perspectives on the Christian Apostasy, ed., Noel B.
FAIRwiki:Table_of_contents#God (Accessed June 29th, 2009). Bible/Nature_of_Prophets_and_Prophecy.html (Accessed June 29th, 2009). I think it is a nice essay. Unfortunately, I can't see the Church publishing it in the Ensign. Far too many members are so unfamiliar with the issues you have brought up, and so I simply don't find it likely that your essay will be published. I think the things we do here in the apologetics world make most members quite uncomfortable. But, don't let me discourage you. Submit it and prove me wrong! "with whom I began to speak with" should be "with whom I began to speak"
The Ensign has a definite template for the tone and content of their articles. While FAIR is awesome...it truly is...I don't know that the Ensign would be inclined to give it a de-facto stamp of approval by publishing direct references such as in this article in the magazine. I could be wrong on that, and maybe they've done it before. I think your great story stands on its own without the FAIR details. You could reference some FAIR articles as your sources and that might get through the editing process. Also, try shopping this version of your story to LDS Living and a variety of other publications that have been popping up over the years. Their editorial guidelines are bound to be less strict as to content and you might have good luck there.